Recently I learned the sire of Plenty O Dually has been sold and his new address will be in Australia. I am disappointed because the cross of Good N Plenty and Dually Pep seems quite good, and I wanted a filly out of this cross. It will probably work out best in the future. O Dually was born in 2005 and on May 31, 2007, I started riding him. O Dually did not seem ready either mentally or physically, so I waited to give him more time. Several weeks prior to his first ride, I had been saddling and tying him. During this time I also had him wearing a ring snaffle with a bailing twine hanger without reins. He just packed it while I handled him. The day of the first ride I tied and saddled him as usual then I put a stool in the center of the stall which I stood on and gradually mounted. He did fine. I rode him with just a halter and lead in the 12'x12' stall giving him a chance to get used to having someone on his back and to get his feet moving. After a few days I added a headstall and reins and had Gail, my wife, pony O Dually and I down the trail. It is a single track trail, so once we were going well she handed the lead to me. He just followed her horse. Usually, when I ride a colt on the trail for the first time, we go about 1/2 mile then turn around. During the ride I send signals here and there with the reins. The second day was the same except we went a little further, always at a walk. Typically, by the third day I can ride by myself and I did. The loop I chose is 3.3 miles and walking usually takes 1 1/4 - 1 1/2 hours. I rode this same loop at a walk for the next 6-8 rides, gradually I asked for the trot in certain sections. It was not very western but most importantly, he was successful. The first 60-90 days I basically walked and trotted him. As his ability improved, I asked for some departures from the trot into the canter, always going uphill on the turn of the lead I wanted---right hand turn for a right hand lead and so forth. Each time I loped a short 8-10 strides then dropped him down into the trot, walk or stop. Keep in mind this was only after he knew how to disengage, was good in the face and well into the 3rd month of riding. The trot is the best gait for colts because they always have their two diagonal feet on the ground for support. Using this method one can gradually leg them up without putting undue stress on their legs. It is wise to remember that during the lope there is always a stride where all the weight is supported by one hind leg. I do not do any turning or twisting on the hind legs in order to protect the hocks. These two techniques are valuable because support of all the body weight, twisting and turning is not good for the young unconditioned colt. During the first 90 days O Dually had about 40-45 rides. I would estimate about 10 of them were mini rides where I rode him strictly 20 minutes while I worked on face, feet, body and mind control at the walk with minimal trotting. Since I have kept his training at a slow pace, he is highly successful. I keep everything short and slow, with very little physical effort, so it is a win for the colt. By the end of 90 days, O Dually had accomplished the ability to stand still while being mounted and dismounted--from both sides and patience while waiting for the departure cue into the walk, trot and canter. He could disengage the hindquarters, was supple in the face and barrel and he was becoming physically stronger and mentally confident. I never asked him to do anything at which he might fail. Gradually, as his self-confidence grew, I could offer him more challenging problems to solve.The first 7-8 rides I rode him in a ring snaffle bit, and the next 6-7 rides in a hackamore. I began using a shank snaffle about the end of 6 weeks of training. I alternated back and forth from the shank snaffle to the hackamore. 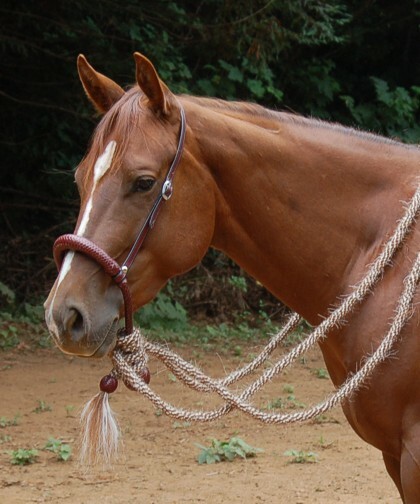 I use the Greg Darnall Loomis NSBA shank snaffle. The Tom Thumb does not work for anything other them a paper weight. The shank is too straight and grabs the horse's face, even with slow hands. I adjusted the curb chain so it hung about 2" in length below the jaw. Check the photo to see how I adjust it for my colts. O Dually rides off the slack of the reins not the curb chain. If he does not respond to the change in the slack of the reins, then I am progressing too fast and must SLOW DOWN!!!! The "slow way is the fast way." It does take longer, but you do not have to go back to correct a spot or go to a "bigger bit." Do not misunderstand me, I will progress up the line to more sophisticated and complex bits. Those bits are for refinement of signal not a bigger bit to control O Dually. O Dually got his first set of shoes in mid October after 4 1/2 months of riding because I will have to travel about 3/4 of a mile on a gravel road in order to ride in a neighbors arena. If I were not riding on the road, I would have left him bare footed. Evaluating O Dually's progress thus far he makes me very pleased. His foot speed or rhythm is slow, but I will gradually speed him up to a rate with which he and I are satisfied. It would be easy to make the mistake of jumping into the middle of him and build a fire under him. Here is the question: Could I put the fire out? I am careful to keep him full of air, successful and happy. The results will be that he likes his job. He stops, cows and rides in the hackamore--all giving me several choices in the future.